Summary: A the American polity rots, we follow a path well-worn by previous Republics. Our society’s observation-orientation-decision-action (OODA) has broken, with each stage become dysfunctional. We cannot accept this, so cognitive dissonance (see Wikipedia) dominates our mental processes. Rather than communicate values, information and analysis, our political speech increasingly serves to disguise our bleak situation. Our Founders looked to the Rome for inspiration and lessons. We can, too. See this excerpt from “It was satire” by Mary Beard, London Review of Books, 26 April 2012 — A review of Caligula: A Biography by Aloys Winterlingj. We can look at Rome and see ourselves, a warning of what lies ahead. The focus of his book is the dissimulation and hypocrisy that lay at the heart of Roman imperial politics, and had in a sense been the foundation of the governmental system established by Augustus. 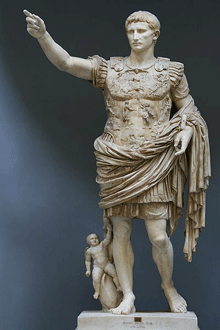 In making one-man rule work successfully at Rome, after almost half a millennium of (more or less) democracy, and establishing a ‘workable entente’ between the old aristocracy and the new autocracy, Augustus resorted to a game of smoke and mirrors in which everyone, it seems, was play-acting. On Winterling’s model, successful emperors after Augustus were those who managed to exploit the double-speak, and turn it to their advantage; the unsuccessful were those who fought against it. — Senator McCain speaking at a debate of GOP Presidential candidates on 2 December 1999 (from the CNN transcript). Greenspan was then 73. In our time, political speech and writing are largely the defence of the indefensible. Things like the continuance of British rule in India, the Russian purges and deportations, the dropping of the atom bombs on Japan, can indeed be defended, but only by arguments which are too brutal for most people to face, and which do not square with the professed aims of the political parties. Thus political language has to consist largely of euphemism, question-begging and sheer cloudy vagueness. Defenceless villages are bombarded from the air, the inhabitants driven out into the countryside, the cattle machine-gunned, the huts set on fire with incendiary bullets: this is called pacification. Millions of peasants are robbed of their farms and sent trudging along the roads with no more than they can carry: this is called transfer of population or rectification of frontiers. People are imprisoned for years without trial, or shot in the back of the neck or sent to die of scurvy in Arctic lumber camps: this is called elimination of unreliable elements. Such phraseology is needed if one wants to name things without calling up mental pictures of them. Previous Post Thomas Jefferson saw our present peril. We should heed his warning. It would appear that I’m not the only one with the increasingly disquieting feeling that the United States appears to be rapidly transforming itself into a 21st Century version of ancient Rome (with all the risks that entails). For that matter, the only thing that really separates American football players from Roman gladiators is the fact that they’re only possessions of the team owners in the figurative rather than the literal sense (although from the players’ perspective, it might sometimes feel as if they’re literal as well as figurative property). Bluestocking, as you presumably know, psychological abuse is common throughout the work world (including academia), it is not limited to “entertainment” and “sports” industries. Anyways – follow up to the ongoing topic of People as Sheep, and artifacts vs. theories: Evolutionary theory, and evidence, explains the contradiction that Altruism (cooperation) is dependent on War (conflict): “Altruists at War“, W.G. Runciman, London Review of Books, 23 February 2012 — A review of A Cooperative Species – Human Reciprocity and Its Evolution by Samuel Bowles and Herbert Gintis. LRB is gated; a free version is here. WTF, I am indeed very much aware of the fact that psychological abuse is common in many professions other than sports and entertainment (including those which supposedly depend upon cooperation as well as those which emphasize and encourage competition). However, in most professions, psychological abuse is at least overtly regarded as something of an undesirable trait and/or unfortunate side effect rather than the essential quality and primary goal that it is in most reality television programs — or that physical abuse is considered to be in American football and certain other professional sports such as boxing and ice hockey. I was also primarily focusing on the fact that television in general (and reality television in particular) has become a means of placating and distracting as well as entertaining the masses in much the same way that the “bread and circuses” of the Coliseum were used to placate and distract as well as entertain the ancient Romans. Football and Roman gladiators are similar, and growing more so. IMO we should worry about this trend. The recent scandals in the NFL, coaches commanding their players to hurt opponents, shows how far this has developed. I’m going to have to disagree on the football comparison. There has more and more concern with concussions in football. Helmet to helmet hits routinely result in fines and suspensions, players are removed in game if they are thought to have a concussion, by an independent doctor. The coach in question has been suspended for a year. Thanks for that news. It’s good to hear! The trend does seem to be toward an increase in abusiveness (dysfunctionality). Excellent explanation of implications in the FM archive: “Careerism and Psychopathy in the US Military leadership“, by GI Wilson, 2 May 2011. As Marx and his followers pointed out, a new set of technologies and economics disrupts morals and social institutions, which lag far behind technology in evolving new paradigms. A culture’s outmoded moral/metaphysical “operating system” when run on new “hardware” (techno-economics) will usually be a disaster. (bad analogy, but perhaps you get my drift anyway). Some analysis along those lines: “The Decline of Scientific Rationalism by John Artz, 24 February, 2002. Engage and empower all stakeholders in decision-making, design, and planning (“early and often”); address the diverse set of needs and perspectives of management, employees, customers, suppliers, the community, the environment, etc. Without loosing sight of the traditional goals of efficiency, productivity, character building, and motivation. … supporting the skills of epistemic sophistication can be as simple as asking the right questions–questions that lead participants to reflect on their biases, be curious about the world views of others, question the limitations of models, monitor the quality of the current social process, and look systematically for missing perspectives. These questions, which can be asked in any moment but can also be embedded into organizational processes, raise the level of awareness and provide a challenge. The challenge must be complemented by social environments that are safe for uncertainty, authenticity, vulnerability, truth-telling, and change–to allow what needs to emerge along the path to transformation to do so. Such challenging questions posed in a supportive environment will uncover new layers of information and options, and from there lead naturally to co-creative problem solving. Because such questions force refection on the very nature of thinking, knowing, and communicating, and because dialog opens participants up to the collective wisdom of the group, epistemic sophistication will develop organically in the context of solving real problems. The other scenario is that it is all “Kabuki Theater” (as some washington news periodically comment) … the objective is to plunder as much as possible and then cover it up. Greenspan was there in the late 90s when the hedge funds imploded and had to be bailed out (obfuscation was that the models the hedge funds were using, couldn’t predict the implosion), and then again when the CDO market imploded (trying to use the same explanation). He was there in the events leading up to repeal of Glass-Steagall; first giving the exemption for the merger of Travelers and Citi, pending getting the law change. A lot of the political conflict is periodically referred to as also being part of the obfuscation and “Kabuki Theater”. Boyd had some congressional cover when he & Spinney took on MIC (’83 Time article gone behind paywall but lives free at wayback machine). Boyd would tell story that SECDEF blamed him for the article and tried to have him assigned to Alaska and banned from Pentagon. But going into the 90s, it appeared that they all went over to the dark side … which could account for Spinney’s strident references about MICC (including “congress” as part of the problem). However, the FRCC (financial regulatory congressional complex) is much larger than the MICC. estimated $27T in (triple-A rated toxic) CDOs done during the bubble – Bloomberg. FM, ever the optimist. I concur with the above. that big IF is the operative word. IF we can get people to sit up and take notice. But history is all but removed from the curriculum of schools. and the Senate is made up of the biggest fools society can discover to run for public office, all full of themselves and eagerly swilling at the public trough while the rest of the country goes down the crapper. As long as we continue to elect the low calibre people Jefferson so aptly describes in his Note on the State of Virginia, the more frightening conditions become. If he was afraid of such a result at the outset, what would he think today to see that not only is his opinion not respected, but that these same office holderts are doing all they possibly can to discredit those opinions. That’s not factually correct. In fact the competition for high office is fantastically intense, and the people at the top have the rare skill set needed to win. While some are fools (as in any group), few are fools. So they are successful in a material sense, but don’t meet your high moral standards. How sad. Who are the fools? These successful people, or the ones who elect them — repeatedly — but get so little in return? Interesting book about Caligula, I hold the same positive view of Caligula and have written a post praising him: The Greatest Roman Emperor, January 24, 2010. Gore Vidal has a great novel, Julian, about another emperor who used satire against the system he headed. I highly recommend this novel. In his last published article Lenin warns that communists were being outnumbered by bureaucrats who did not believe in the ideology (Better Fewer, But Better). Modern China is dominated by a privileged political-military class running the state to their advantage. I see the US at a similar point with a large state bureaucracy and security apparatus that would control whomever in the ultimate position of power. This bureaucratic class shows very little sympathy to the underlying ideology of the US, namely the constitution. Even if the people try to change the situation through the elections, as you hope, elected officials would be almost powerless to change the state. Montaigne’s great friend, La Boetie, wrote “The discourse on voluntary servitude” in which he asked why it is that people place themselves in subordinate positions to incompetent and corrupt leaders or tyrants. It’s a good question – there are millions of us and relatively few of them; why are the powerful allowed to keep the power that they have stolen from the people by means of outright fraud or force? My answer is unfortunate. People of La Boetie’s time hadn’t really even identified “nature/nurture” as a question, let alone given it any thought. Yet, it appears obvious that we are pack/social animals just like our close primate cousins the chimpanzees, orang-outans, gorillas, etc. – all of which form societies that would be “tyrannies” if writ on a human-scale. It appears to me that it’s human nature that there are many who are pre-programmed by selection to follow, few who are inclined to be skeptical of everything, and fewer still whose nature and nurture combine to produce sociopathic individuals; people who can sit outside of society and see it only as a useful target for manipulation. Such are the people who hijack young males’ group/pack hunting behavior to get them into uniform to kill strangers on the behalf of other strangers. This is relevant because human-constructed political systems do not take into account the fact that a great number of people want to be led – even if off a cliff – and would accept almost any expedient that allowed them to avoid thinking or forming an opinion. The successful political systems and empires (including Rome, of course) all sported this politics of appearance. The newer ones (specifically here I am thinking of what China’s plutocracy is evolving into) are incredibly sophisticated at giving the “led” a feeling of comfort in their role (while occasionally culling or fleecing them) while producing a political system that appears to listen to people but, in fact, serves the plutocracy. The US was the ground-breaker in advancing this kind of pseudodemocracy; its founding fathers were plutocrats who ensured that they had a grip on the reins that was sufficient to keep things moving in their favor, while making it hard to actually rock the boat. I see the US Civil War as breakdown in the division of spoils between rival plutocratic groups. Rome experienced similar dynamics as, eventually, their plutocratic families swallowed so much of their own propaganda that they appear to have mistaken themselves for the gods they sold themselves as. The state of the art pseudodemocracy (first seen in the “Little Committee” in 18th c. Zurich) includes mechanisms whereby the people can participate in what appears to be a political process that might offer “Hope” for “Change” – this hope is false, and change will only come about if the plutocrats wish it. True change in pseudodemocracies happens in the form of internal purges, not elections. Like the US’ electoral system, in which a citizen can paint a target on their back by attempting to bring about change from within – the pseudodemocratic system actually acts as a filter which identifies dangerous trouble-makers, who can then be sucked into the process and destroyed by the simple process of sapping their effort on a pointless treadmill chasing “Change” that is always just around the corner. A weakness characteristic of human kind is that we often have to obey force; we have to make concessions; we ourselves cannot always be the stronger. Therefore, when a nation is constrained by the fortune of war to serve a single clique, as happened when the city of Athens served the thirty Tyrants3 one should not be amazed that the nation obeys, but simply be grieved by the situation; or rather, instead of being amazed or saddened, consider patiently the evil and look forward hopefully toward a happier future. “For the love of gain would reconcile the weaker to the dominion of the stronger, and the possession of capital enabled the more powerful to reduce the smaller cities to subjection. — History of the Peloponnesian War, Book I, 1.8-, by Thucydides. We have a clear winner for Quote of the Day. This shold be posted on signs across America.